The San Juan Islands Agricultural Summit returns to San Juan Island February 2nd and 3rd for the 7th year of education and celebration of the islands’ food and farming communities. Offering a selection of twenty different workshops and sessions, this year’s Summit is sure to have something for everyone engaged with our local food system. The Summit kicks off Saturday with eight hands-on workshops around the island. Dive deep with local and regional experts on topics like “On-Farm Fire Safety and Preparedness”, “Funding for Farmers”, and “Keeping it Cool: Cold Storage Options and Implementations”. These stand-alone workshops are $25 with advance registration, $30 day-of. The whole community is invited to kick back Saturday night at the Summit Hoedown at Brickworks from 6-9pm. Enjoy live music from local group River Rye while savoring a BBQ dinner from San Juan Bistro. Tickets will be sold at the door. $5 cover, $20 dinner inclusive. Youth seventeen and under free entrance, kids meals available. Gather on Sunday at Friday Harbor Middle School for a day of classroom sessions. 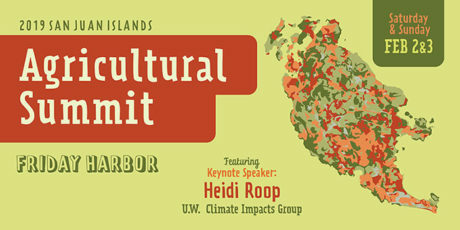 Attendees will hear from University of Washington climate scientist Dr. Heidi Roop. 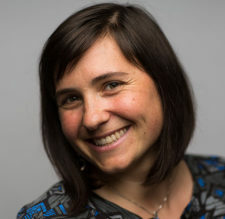 Her keynote address, “From Coastlines to Crops: What Climate Change Means for the Puget Sound” will highlight the range of climate impacts we expect in the region. She will dissect the science of climate change communications, and propose steps to catalyze the action needed to confront the climate change challenge head-on. The full Sunday program includes a selection of twelve classroom seminars. Highlights include a history of farming and agriculture in the San Juans, navigating on-farm labor practices, plant breeding and climate change, water rights, pasture renovation, and more. Sunday’s all-inclusive ticket includes breakfast and lunch from Market Chef, keynote address, and all Sunday Sessions. $75 advance registration closes on January 29, $85 at the door. More information including the full event schedule can be found on Eventbrite, or by contacting Summit organizers at sji.agsummit@wsu.edu or calling WSU San Juan County Extension office at (360) 370-7667. RSVP for our event on Facebook and share with your friends. While the Summit is geared toward adults, youth are encouraged to attend at no cost. Please contact us to register any youth under 18 free of charge. Reasonable accommodations will be made for persons with disabilities and special needs who contact us at least two weeks prior to the event. Extension programs are available to all without discrimination.